The downloads for my scrubs hats are FREE!--Why? The PDF downloads are hand drawings that are not digitized. I didn't want to charge money for a pattern that doesn't have a truly professional look to it. Where do you find the pattern downloads? At the very bottom of the homepage. As you will see I have named each hat according to the quirky style or pattern on the fabric. I challenge you to make each scrub hat unique. Give each hat it's own character. Happy sewing, love what you create! 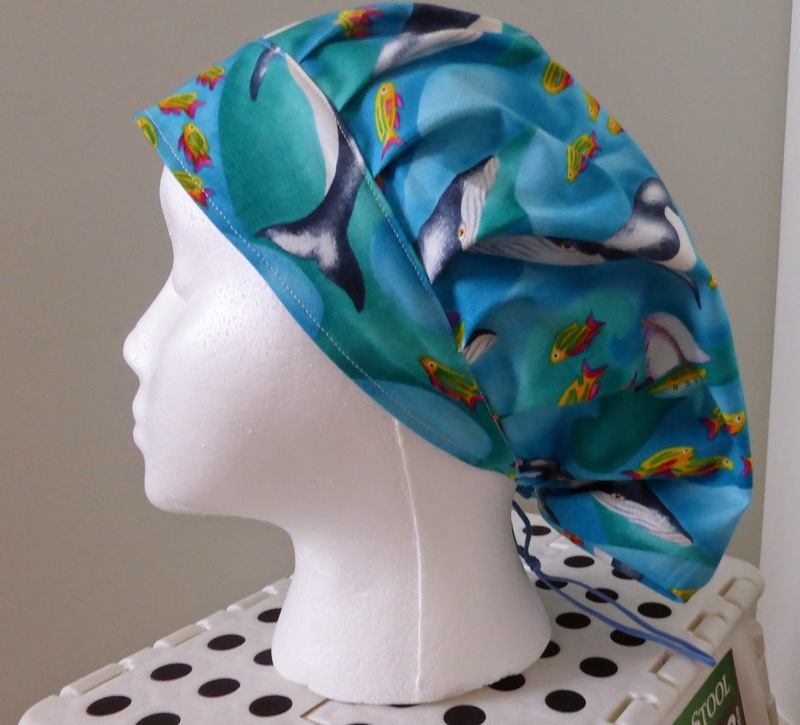 Pattern for "The Hummingbird Scrub Hat"
Pattern for "Whale Watching Scrub Hat"
This is bouffant style of scrub hat. It has pleats in front and a drawstring with a toggle in the back making it possible to adjust the fit for any head size. I just love the aqua blue of this fabric and the cute little pink and yellow fish on it; but the name of this hat comes from the majestic whales that are on it. The pleats are not marked out on the pattern. They are just created by pinching and pinning down the fabric. They don't all have to be exactly the same size or distance apart they still look great. I will explain how to make the pleats fully in the tutorial. If you consider your sewing expertise to be at an intermediate level you should find this hat fairly easy to make. Step 1: Download the pattern from Pattern Downloads. Print the pattern out, then tape sheets together as instructed. Cut out pattern on solid lines. Step 2: Start with "Top piece A". Lay the pattern out on your fabric. If the fabric has pictures on it keep in mind which way the pictures are facing in relationship to the pattern. Think about someone standing behind you and looking at the hat. The pictures should be facing right way up. This means the pictures may look a little upside down at the front but this doesn't matter because you will make sure the pictures face the right way up on the headband. This is the way the hat will look the best. Place the pattern on a fold as instructed. Think about where to make the fold. Just make the fold big enough to fit the pattern piece. If you fold the fabric in the middle just as it comes off the bolt the pieces left on either side will not be long enough for your front headband. Optional Alternative: Take a piece of freezer paper. Fold in half. Place pattern on fold, then cut out. You are left with a pattern piece that you can iron right onto your fabric. (Shiny side down when you are ironing) This way you don't have to fold your fabric. The pattern will stay put as you are cutting it. You will be easily able to remove it after cutting, and it will not leave residue on your fabric. You can reuse this paper several times before it is worn out. Step 3: If you have a serger, serge the straight bottom edge of the mushroom stem. Then serge all the way around the curved edge of the mushroom shape. If you do not have a serger you may want to zig zag stitch these areas. Now looking at the drawing below sew the two edges together as shown. Make sure you put the right sides of the fabric together. If you use a sewing machine you should also zig zag stitch the edges of the seam allowance to prevent fraying. This is a drawing of the pattern piece. Sew where I have drawn the dotted lines. This seam doesn't show when the hat is worn. It is at the bottom back of the hat. I pulled it over to the side a little just to point it out here. Cut two headband pieces out of fabric. Once again place the pattern piece on a fold of the fabric. Think about pattern direction and what you want in the middle of the headband. I wanted a little school of fish in the middle of the headband so I made sure the school of fish were on the fold. The straight edge will be the bottom of the headband and the curved part will be the top of the headband. Next place right sides of both headbands together and sew the straight edge. Open up and give it a little press with the iron. Fold it in half again so that the interfacing is in the middle and the right side of the fabric is facing up. Give it another press with the iron. You will notice that at each end there is a little "tail" from the seam allowance. Just take a pair of scissors and snip these little "tails" off. Step 5: Time to make the pleats. The idea here is to create pleats starting at the middle of the front of the hat. They will extend all along the front and side where the brim is attached. Just behind the brim you want to stop pleating. This portion will be gathered by the drawstring. This photo should give you an idea of what we are going for here. Notice I created a crease with the iron to mark the center from of the hat. The pleats have all been created to go away from the center point. See how the back portion of the hat is gathered by the drawstring. I created the pleats by pinching one finger width of fabric at a time and then pinning down. I started in the middle and worked my way out. As you can see here it looks like I'm forming the pleats facing towards the middle of the had but that is because we are looking at the back side of the fabric. Once we flip it over and look at the front they will look like they are going away from the center. I made six pleats on each side. Try making six pleats then hold the center point of the headband to the center point of the hat. Line up the edges of both pieces and see where the pleats stop. If the pleats extend farther than the brim adjust them so they don't. If you made small pleats you may need to add more.Carefully sew the pleats in place removing pins as you go. You do not want to lose the placement of the pleats. Now you can see your hat is really taking shape! Step 6: Line the brim up with the hat. The brim must be open. The inside part of the brim curve will be placed to the inside of the hat. In other words the right side of the fabric of the inner brim goes to the wrong side of the fabric of the hat. Match the middle points together by placing the brim on top of the hat. Put one pin at the middle point and match the rest up pinning as you go. Before you start sewing look at where the transition point will be from the brim to the part of the hat that gets the drawstring. You want this transition point to be as smooth as possible. (My transition point didn't turn out perfect because I top stitched the straight bottom edge of the headband before I sewed the headband on.) Using the iron just press the bottom edge of the hat under a little at this transition point. It will get sewn down later when you sew in the drawstring. Sew the brim on with care, removing the pins as you go. Keep the edges of the hat and the edge of the brim nicely matched up as you go. Flip the brim closed and top stitch the straight bottom edge of the brim so it looks nice. Carefully top stitch the curved edge of the brim down to the front of the hat. Make sure the brim is lying nice and flat as you go. You do not want any ripples in it. Step 7: Iron the bottom edge of the hat that is not included in the brim under 1/2" (You have already ironed a small portion of it before you sewed the brim on. Now just iron the rest.) Find the middle of the back of the hat. Make a small crease to mark the spot with the iron. Cut a small piece of interfacing 1/2" by 2 inches. Iron this on at the middle of the back. Step 8: Cut a piece of cording about 11-12 inches long. (Mine was a bit longer but the tail hangs down a little longer than I would like at the back) Thread each end of the cording through the toggle. Thread the ends of the cording through the buttonholes. Securely sew the end of the cording down on each side inside of the seam allowance just close to the transition point where the brim ends. Tuck the cording in close to the fold at the bottom edge. Stitch all the way along the bottom close to the edge. May sure you don't catch the drawstring anywhere along your stitching other than at the ends where they are secured. If your drawstring is shorter than the distance of the bottom seam there will be some gathers in the bottom edge that you will need to adjust as you sew along. You just want the portion you are sewing at the time to be free of gathers. That's it, project is complete! How did it go? Please leave feedback for me. I would like to hear how it went. Were the instructions easy for you to understand. Is there a step that could be worded differently to make it easier to understand? I would like to see your project on the flickr page. Tried to download pattern and it says there is no page for this blog. Can you send it to me? can't seem to download is it possible for you to send copy of Whale watching? I would like them all if possible. Perhaps you could help me download. I am looking forward to making this for my daughter but I'm not sure what these directions mean: "Now looking at this mushroom shape, the edge that looks like the bottom of the mushroom cap and the edge that looks like the side of the stem need to be sewn of serged together. Make sure you put the right sides of the fabric together." Do you have a picture or drawing of what this should look like when sewn? Thanks! I volunteer in a kitchen and have to wear a head covering at all times. I saw it his one and knew it would work perfectly. I loved the way this scrub hat looked when I got it done. The pattern was really easy to follow until I got to the little side seams. I thought the right side was sewn to the left. When it wasn't going to fit, I realized the L shaped sides were sewn to themselves did I understand. I used a contrasting color for the brim and it really popped. It is really comfortable to wear and I plan to make many more. Did anyone eventually get the pattern to download? Where do you download the patterns at? Just click on the photo below the description of the hat. Can i please have a way to download pattern? I've sewn 2 bonnets, so far, and I really like how they turned out. The second one that I made, I added almost a full inch to the entire circumference of the top piece. I left the brim size alone. Love this even more than the original. Thank you for sharing this. I enjoy wearing my bonnets in sterile processing. By the way, I have waist length hair and the second bonnet fits all of it, comfortably. I'm an OR nurse and I sew my own scrub hats. I am happy to share my designs with you. Please leave feedback. I would love to hear how your scrub hats turn out! Let me know how it fit and if you made any changes to the pattern. Please join the Miss Muffet flickr group simply by clicking on my photo.